Growing up in a small town is who I am. I know every street, store front, and house around. We used to be a self sufficient community with everything from two grocery stores and two gas stations, and a cafe and clothing store to a community with limited conveniences. But still a great place none the less. At 13 years old and no drivers license it was ok to ride around town on my Harley-Davidson 90. I would ride to the Vicker’s gas station on Main street to get 50 cents worth of gas, a Snickers bar and a Mountain Dew. Herb Funk would require a 3 cent deposit on the bottle if we took it so I would eat my candy bar and drink the Mountain Dew there while hanging out with the regulars. It’s a wonder I didn’t pick up smoking cigars as a few of the old men did, but it was always fun to watch Herb fix a flat or go out to pump your gas. Looking back I have often wondered what he thought of us young guys on our bikes hanging out. As young men we never thought from that perspective. We were more consumed with the moment. But one advantage to a small town is a local police officer that wasn’t to concerned about us riding around on the streets. And apparently neither were my parents. Frank was the local cop and he was also the city maintenance man so a lot of times he wouldn’t go out on patrol until the evening hours. Long after I had to be home! Both Herb and Frank were good guys. They are like so many people in White City that had a lasting affect either on the community or me personally. Exploring the streets and country back roads for hours on end was great for a kid. Probably not something parents would allow now but it was the early 70’s and I guess that made it ok. 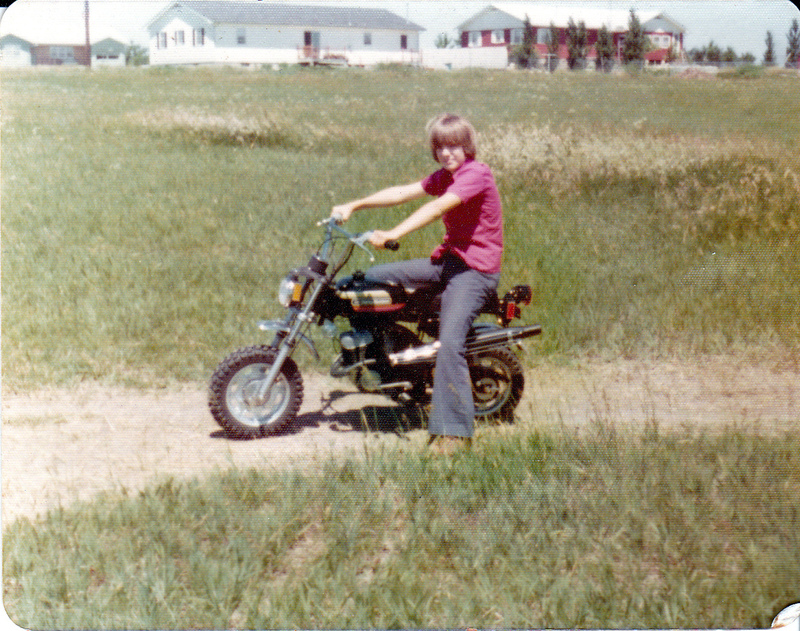 Wearing the appropriate stars and stripes helmet, bell bottoms and a “what, me worry?” t-shirt and I was set. So many times we would ride out behind the grain elevator to what we called the Katy trails where the Katy train tracks used to be. It was a small area but it was all we had. You would think growing up here I would know everything about everything but it took me twenty years to find out who actually owned the property. One more person that really had an impact on us as young riders remained anonymous for most of my formative years. For that I thank him. He allowed us to ride there any time and never once said a word. Again, we didn’t think about that then, we were too caught up in the moment of being the future of our sport! This was also a time when the summer days lasted forever. The sun hovered above us and time stood still. We went home dirty and tired, strung out on Snickers and Mountain Dew. Blisters on our hands, bell bottoms torn from getting caught on the chain and sprocket and out of gas. Good times. I still live in this town. Some of the people that have always been “White City” have passed. Herb, Frank, Perry Moore who owned the grocery store and Earl Casterline, just to name a few, are missed. I wish I could tell them now that I’m an adult how much I appreciate them for making this town a great place to grow up. Now that I’m not so much in the moment of being a teenager, I would like to know what they thought of us. If I was a betting man they were thinking “those crazy kids and their damn motorcycles!”. If only everyone were so understanding of what it is to be young…… And if only the young were as understanding of what it is to be old. Utopia indeed! Really enjoyed reading this. Thanks Steve! As weird as it is, looking back on my life and growing up the way I did, it does take a village to raise one crazy nut that loves motorcycles!